Home » Moms & Dads & Babies » Infant Packing Where Do You Start? Infant Packing Where Do You Start? Traveling with an infant can be very stressful especially with a new born not knowing what to pack and how much to pack. 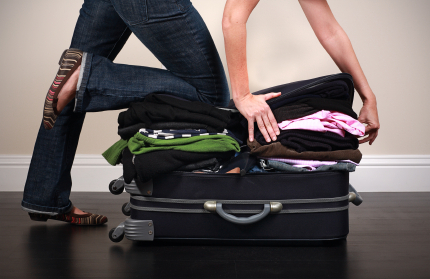 For me, it was the first time I had to worry about packing for someone other than my husband and me. I was told that I needed to bring two outfits per day in case my son had a blowout or threw up. Wow, that is a lot of clothes. Like a new mom, I took the advice only to realize after several trips that I did not need two outfits per day and came home with a lot of clean clothes. OK, maybe that is not such a bad thing on the laundry front, but not good in trying to minimize bags. This is great advice, especially if you are traveling via car and you have no place to wash laundry, which the first couple times we traveled via car this was the case for us. But in order to reduce my luggage, I developed my own rule of thumb, one and half outfits per day. For example: a six day trip, I would take 9 onesies. I am no pro at traveling, but we have done several long road trips with our son including a 50 hour car ride in 10 days and crossed 13 states, so after preparing for that trip, I feel more equipped to provide a infant packing check list. I developed an infant packing check list of necessity items that I needed to remember when traveling with my son. Your list will become more modified and honed over time based on your baby’s needs and yours, but hopefully, this is a good starting point for you. For additional packing resources check out BabyCenter.com. Good Luck! Hopefully, this will lead you down the path of becoming a more efficient packer. My husband is wondering when it will happen for me.